When it comes to choosing to side for your greenhouse you have basically 3 choices: glass or plastic (fiberglass, polycarbonate, polyethylene film). Which is the best choice depends on how much insulation your greenhouse needs and how much you can afford to pay. 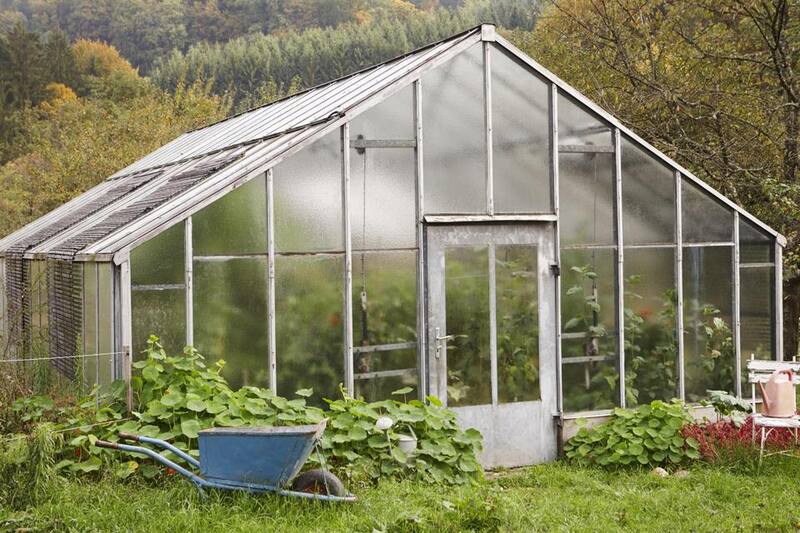 Here are some pros and cons to weigh when selecting siding for your greenhouse. Glass is beautiful but inefficient for heating (.95 R) and easily breakable. It needs to be double or triple strength to be practical. Doesn’t diffuse light and can burn plants. It's heavy and requires a sturdier frame, foundation and smaller, more numerous panes. Can be drafty, because of the number of panes and joints. Framing needs to be perfectly square and rigid. May require a pro to install. Plastic greenhouse siding includes fiberglass, polycarbonate, polyethylene film and whatever improvement they come up with next. They are all lighter and more flexible than glass, so they can come in larger panes or sheets, reducing drafts and making construction easier. Fiberglass isn’t transparent, but almost as much light makes it through fiberglass as glass greenhouses. The light is diffused and the fiberglass used for greenhouses is given a gel coat for UV protection. It retains heat better than glass and provides good insulation. (.83 R) Fiberglass is a good starter greenhouse and would be sufficient for a gardener who just wants a space to start seeds in the early spring. Polycarbonate is also a corrugated plastic, but it is almost as transparent as glass and it is the strongest siding being used on greenhouses. It also wears longer, up to 2-3 times longer than fiberglass. You’ll find polycarbonate in single, double (1.4 - 1.9 R), and triple (2.5 R) wall thickness. Single wall polycarbonate is the least expensive and makes the sleekest appearance. However, it offers less heat retention, light diffusion, and strength than it’s bulked up brothers. Double and triple wall polycarbonate provide even better insulation because of the air pockets between walls. They are also more expensive, but you’ll save on heating costs. Another advantage of polycarbonate is its +15 year lifespan in most areas. If you’ll be overwintering tender plants or trying to grow vegetables all winter and running your greenhouse from fall through spring, polycarbonate is your best bet. Polyethylene film is a quick and inexpensive option for gardeners who use their greenhouse mainly for seed starting. It comes in sheets that can be used in single or double layers, for better insulation. (.85 - 1.4 R) It works well, but it doesn’t last long, maybe 2-4 years, depending on the product and the weather. Commercial growers like it because it’s cheap, offers flexibility and they have a crew to replace it every few years. Polyethylene film works best if you have a double layer with an air space between.